Every so often in life, I have times where I can disconnect myself, step back and just think 'this sums up me and my life'. It could be how I deal with a situation, or winning something, but being me, I would say 99% of of the time this happens after horrendously embarrassing or awkward moments. And the thought I have whilst looking and thinking about what just happened is quite simply 'This would never happen to anyone but me'. In fact, these things happen to me so often that people reply to my stories and life tales with 'that's such a you thing to do' or 'this could only happen to you'. I realised pretty early on in life that I was set for a bumpy ride, and over the years I have somewhat established a hard skin to falling over, tripping up, saying awkward things, being caught in awkward situations, but on my visit to Tuscany, two events took place which, after careful pondering, I decided to share with the whole world on the internet. It's a bit like Embarassing Bodies when humans with awful problems decide to share with millions of people. Except my problem is my life. On the second day in Tuscany, after a 9 hour day of traipsing around towns the day before, my host family decided we needed a trip to a spa resort. On arriving, we were all given dressing gowns and after paying we were free to use the two massive thermal calcium pools and sun bathe with beautiful views over the Tuscan hills. After about an hour of lazing about, my host mum passed me a sheet of paper and said 'this is for you'... it was a half hour relaxation massage. At first I panicked because, although my Italian isn't terrible, Massage Itlalian Language is not quite in my vocabulary... and also, I am not really a massage kinda gal. But after my plan to escape and laze in another part of the resort was thwarted by my host dad offering to show me the way, I had to succumb. It was only a massage after all. I went into the waiting room, where on offer was ice cold water or hot chamomile tea. There were a couple of other ladies waiting in there too and a lovely calming music playlist. The peacefulness worked its magic because soon my panic ebbed away and whilst waiting, I found I was quite excited for my 'Relaxation Massage'. A couple of very made up masseuse' came and took the other ladies away until it was just me on my own. And then my name was called. At first, I didn't even think it was me the voice was calling to, I thought a couple had entered without me realising. Except then it said my full name, and sure enough it was an Italian male masseuse. I have no problem with guys wanting to be masseuse'. In fact, if you are an attractive male, or a boyfriend, I positively encourage massaging. But this was entirely different. I followed him nervously into the room, debating whether to just take down my bikini straps or undo the whole thing, considering whether to rest my head on my hands or lie them flat. I was interrupted by the masseuse saying 'Please hang up your dressing gown on the hook, put this on and lay on the bed face down'. And then he passed me a little plastic bag. As soon as he left I ripped open the bag, to find a thong made from what looked like tracing paper and string. And that was all I was given. The thought of slipping my (completely unprepared) body into this tiny thing made me feel sick, and I considered making a run for it but got scared they would catch me or he would see me sneaking out of the room. So instead, I slipped off my bikini, put on this god awful thong and after a second of hesitation, grabbed a towel lying on the floor and put it over my bum, before lying face down on the massage table. In came the massage man, who simply tutted at the towel, removed it and replaced it with a clean but smaller one higher up my body and I am positive not much was left to the imagination. And then he just started dripping hot oil over my body and began his rubbing and squeezing and poking and prodding all whilst I silently cried and begged for it to be over. But oh no. Just as I thought things couldn't get any worse and after him literally rubbing oil over every inch of my back and legs, he asked me to turn over. And, like a helpless, stranded whale, I hmf-ed my way around, and quickly realised that at least half of my bits and bobs would be on display at one time. The next 10 minutes where excrutiating, and way too close for comfort. After 30 minutes of endurance he finally finally finally stopped and told me I was a) very tense and b) could stay in the room for as long as I liked. Needless to say, the second he was out, I threw on my bikini and ran for that door. For most people, the universe would probably decide that's enough mortification for a life time. But as I am not most people and bad fortune follows me everywhere, two days later horrifically embarrassing moment number two struck and this time, in front of far more people. On the way back from Tuscany, my host family offered to drive back via Pisa to give me the chance of seeing the big leaning tower itself and for us to have a spot of lunch. After eating, we went to the grounds where the leaning tower is and sure enough, it is no cliche, there were literally hundreds of people doing the 'leaning-with-your-hands-out-in-support' pose. As you'd expect, the place was very busy although there was a lot of space (and two other beautiful buildings) so it wasn't too cramped or anything. 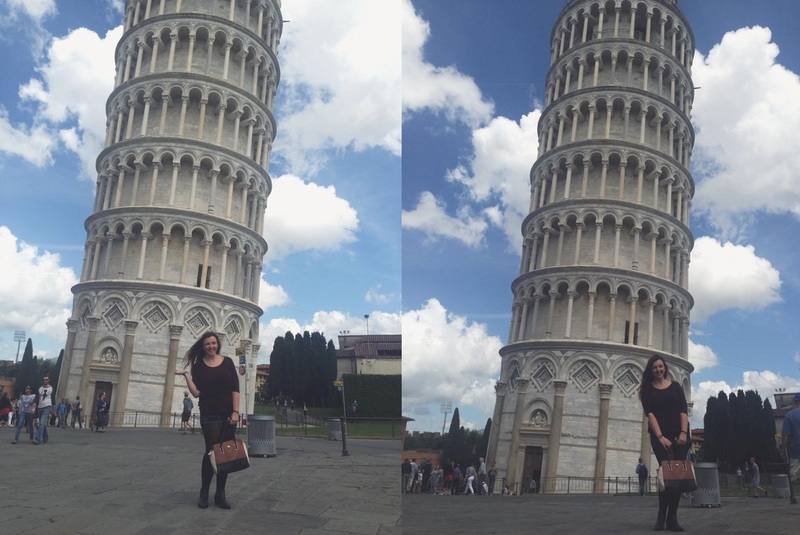 Maybe it was karma for believing I was too cool to do the leaning pose and opting for a simple stand awkwardly pose, (as if I'd ever be too cool for anything), but as I was walking with my host family, uploading a picture of the leaning tower of Pisa to my instagram, I tripped. I don't even know what I fell over, my feet sometimes just decide they've had enough for the day, but I really stumbled and as natural instinct would have it, I grabbed onto the nearest thing to support me. Which happened to me a fully leaning-in-support-pose German man. So I grabbed onto his hand as the woman taking the picture, and my host family, and all the other people around me watched. And although I didn't quite drag him over with me, my attempt at saving myself didn't even work. I fell flat on the floor, the man was fuming, I was bruised and my host family were crying with laughter. I hope you feel enlightened into what it's like to lead my life. Maybe you'll even take pity on me. You definitely should, it's not easy being Alice Dodd. I should add that apart from these two incidents, the trip was really lovely and I thoroughly enjoyed myself. I was going to write a post on it but didn't want to bore you, so thought I'd just 'fess up to these two moments in my life which are high on my leader board of 'worst existing moments ever'. I hope you're all spick and span!